High intensity discharge (HID) is the preferred lighting system for a garden room. The two types of HID lighting commonly used are HPS (High Pressure Sodium) and MH (Metal Halide). HPS lamps deliver more of an orange/red spectrum, which is ideal for most plants in the flowering/blooming stage. 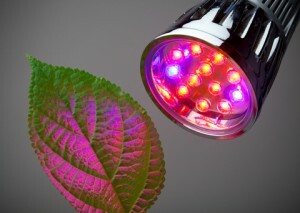 MH lamps deliver more of a blue/green spectrum, which is ideal for most plants in the vegetative/growth stage. Another type of lighting ideal for plant growth is T5 lighting. T5 lighting is a high-output fluorescent bulb with low heat and minimal energy consumption. It is an ideal light for cuttings, mother plants, and short growth cycles. Remember that all plants require light in order to grow and bloom. Most plants grow and bloom according to the amount of light they are given. In the growth or vegetative phase plants typically want 15-18 hours of light per day. In the bloom stage you reduce the amount of light the plants get to 10-12 hours per day. You want to make sure the light comes on and off at the same time each day (just like Mother Nature) the best way to do this is by having your lights on timers.